If you were to ask me if I preferred "sweet or salty" types of snacks, I would definitely say salty. I do like the occasional sweet, but give me pretzels or popcorn and I'm a happy camper. But in the summer I do love ice cream. 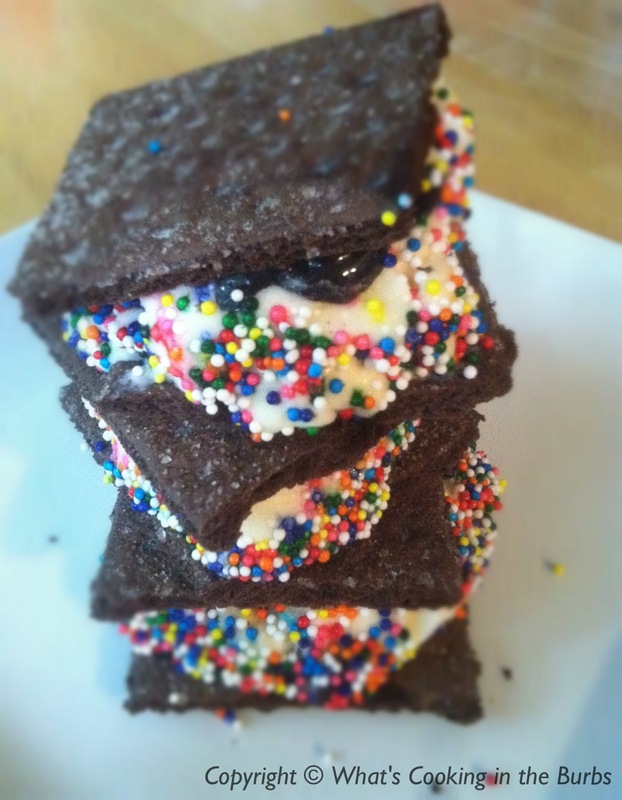 One of my favorite guilty pleasures are big ole ice cream sandwiches. (Which are obviously not at all diet friendly. Sniff.) So, I decided to come up with my own "Skinny Version." These were beyond good and I didn't have to feel guilty! Snap each full graham cracker sheet in half and lay out on the wax paper. Place 1/4 cup ice cream and one tsp chocolate sauce on one of the 2 graham crackers and then top with the other. Coat with sprinkles. Place in the freezer for about 1-2 hours or until set. Enjoy! Skinny, yet yummy and fat-looking?? Count me in!! My daughter, who has recently lost 85 pounds on weighwatchers and loves peppermint will thank you for this recipe!! Since I blog about baking, she loves it when I can slip in a treat for her! What a great recipe. Who can resist chocolate and peppermint icecream. I love that they only have 123 calories! What a great treat when you are trying to watch your calorie intake but want something sweet. Thanks for sharing on the BBQ Block Party. Here from a peek into my paradise: wow! Peppermint + ice cream! Yes please! Peppermint ice cream is my favorite. Gotta try these soon. Thanks! These look scrummy even if they are skinny!